This Franklite Delft traditional twin wall light in polished solid brass features traditional Flemish style. 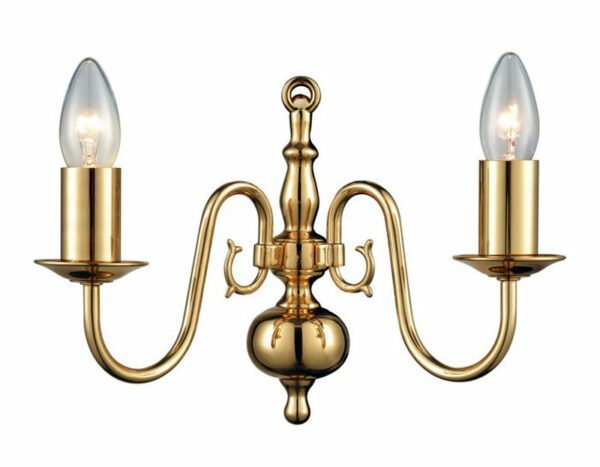 Constructed from solid brass, with baluster wall mount, two double curved arms and candle style lights. Metal candle pans and matching candle tubes complete this classic design. The candle tubes are removable if you wish to fit glass shades. A lovely quality wall light fitting that will enhance your bedroom, hallway, living room or dining room wall. There are matching fittings available in the Delft solid brass lighting range, please scroll down this page to view. This classic light is supplied by Franklite Lighting who have been one of the pioneers in the design, manufacture and distribution of high quality lighting such as the Delft traditional twin wall light in polished solid brass with Flemish style you see here.